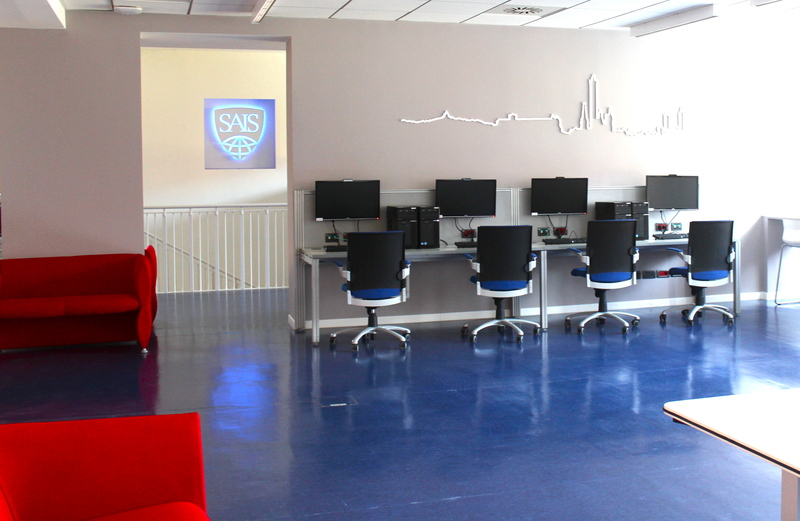 SAIS Europe unveiled a modern, tech-friendly student lounge and study space this week after almost a year of discussion and planning by SAIS Europe’s administration and SGA. The new space, to be used exclusively by SAIS Europe students, will serve as both a compliment and an alternative to Giulio’s Café — long a cornerstone of student life — and the library. The space is meant to be versatile and adaptable to students’ needs, emphasized Director of IT at SAIS Europe, Paolo Forlani. To that end, several modular tables on wheels allow students to rearrange the room as they wish — push them together to create a cluster of tables for group study; pull them apart for more intimate chats or solitary work; or shove them aside altogether to make space for a yoga class or a dance-off. The space also boasts writable walls, several electrical outlets and eight high-speed computers with hi-definition streaming. These computers are intended for students who opt to leave their laptops at home for the day but still have multimedia needs. In addition to its study-oriented purposes, the space will double as a student lounge. Two leather couches, vestiges of the former lounge, invite napping, and a 55-inch LCD TV, equipped with DTV, allows students to plug in their laptops to watch downloaded movies and TV shows in between classes. The renovation also resulted in two new state-of-the art classrooms on the mezzanine level of the building. The idea to update the space had been in the works for several years based on suggestions from students, but it was an earthquake that struck Italy in 2012 that provided an impetus. A post-earthquake inspection revealed some necessary renovations to other parts of the building. Given the slow and convoluted process of securing Italian building permits, the administration decided that it might as well take on the lounge project at the same time. Although the project has yet to be paid for in full, Drakulich estimates the total cost of the two projects will amount to about $300,000, one-third of which represents the post-earthquake structural work. SAIS drew the majority of funds from reserves and received an $80,000 USAID American Schools and Hospitals (ASHA) Grant to cover costs of the technology for the new space. Student input drove plans for the renovation. After regularly observing students pushing away the keyboards at computer lab desks to make room for their own laptops, Forlani and Drakulich convened a town hall meeting in fall 2012 to learn what students really wanted and needed. “It was an open discussion — no talk of budgets, limits. We just wanted to hear all the ideas,” Forlani said of the meeting. The discussion made it clear that new technology had eclipsed what the old space offered. The new lounge aims “to catch up with and keep up with rapidly changing technology needs,” Drakulich said. To be able to keep up, it is important that the space is adaptable, said Forlani. “We want the students to be able to make the space whatever they need as their needs change. If there’s something missing, we want to know. It’s their space,” he added. Some ideas already on the table are to add an X-Box station and a satellite TV. Drakulich is still struggling to name the lounge, but he hopes an appropriate name will arise from the students as they make the space their own.